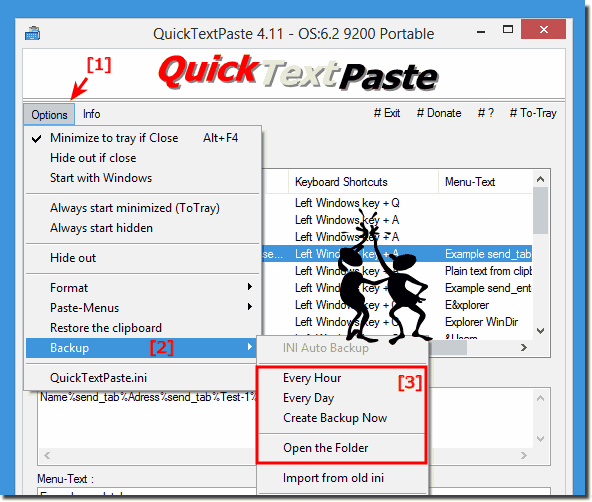 Activate the Auto Backup Feature in QuickTextPaste, is possible from Version 3.63 and it is suitable for Windows 10, 8.1 and all others Windows OS! 1.) ... For what´s this Auto Save Feature and how to use? 2.) ... More info about Auto Save in QuickTextPaste! 3.) ... Why is the function "INI Auto Backup" greyed out? 1.) For what´s this Auto Save Feature and how to use? For example, if you accidentally delete one or more commands is the auto backup very useful! Please click or tap on Options Button in QuickTextPaste select the menu entry Backup! I use also permanently Quick Text Paste and the commands and text snippets are very valuable for me! I will not lost this make the work on my PC faster and save me so much time. If you want to create an auto backup every hour or on time per day please select this option! If you want to see or delete backups select the menu entry Open the Folder! The Autobackup will be create only if change or add new Commands and taking into account the personal settings. 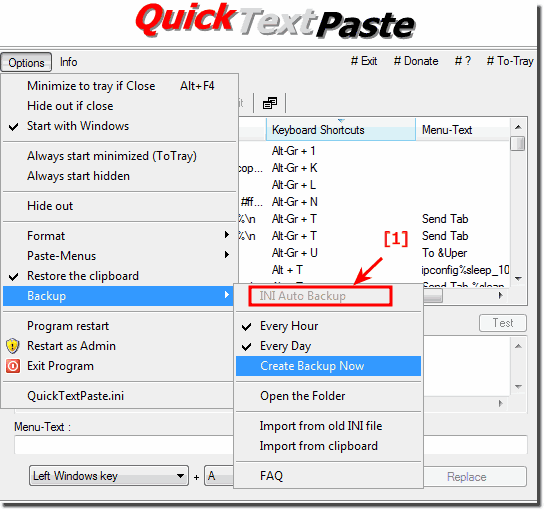 (Image-1) Auto Backup Feature in QuickTextPaste! The ini value use_backup_h is for hour and use_backup_d is for save daily! (Image-2) Backup Folder of QuickTextPaste! 3.) Why is the function "INI Auto Backup" greyed out? This is only the Title of Auto Backup Feature in QuickTextPaste! (Image-3) Auto Backup Feature Title in QuickTextPaste! QuickTextPaste - FAQ-25: Activate the Auto Backup Feature in QuickTextPaste!